Traffic congestion is no stranger to any user of the public roadways in South Florida, nor road users in most metropolitan American cities. We all deserve an equal opportunity to get where we need to go. Cars are an important part of our mobility but it is important to realize that not all trips require a car. As a society, we need to make an effort use our personal motor vehicles less to alleviate congestion in conjunction with our simultaneous efforts to make existing traffic flow more effectively. There are a multitude of proposed solutions to the problem of congestion. For example, researchers at Florida Atlantic University are developing “smart” signals that use computerized algorithms to adjust traffic signal timing to make the best use of gaps in traffic flow. These signals take advantage of existing gaps in traffic but do not address vehicle quantity. When traffic flow is consistent and without gaps smart signals no longer provide their maximum intended benefit. In addition, studies suggest that even building additional roads can increase traffic congestion. Reducing traffic congestion cannot rely exclusively on managing existing traffic alone. It will also rely heavily on using transportation methods that have a smaller traffic footprint. Let us consider an existing method used to reduce congestion around schools: the school bus. 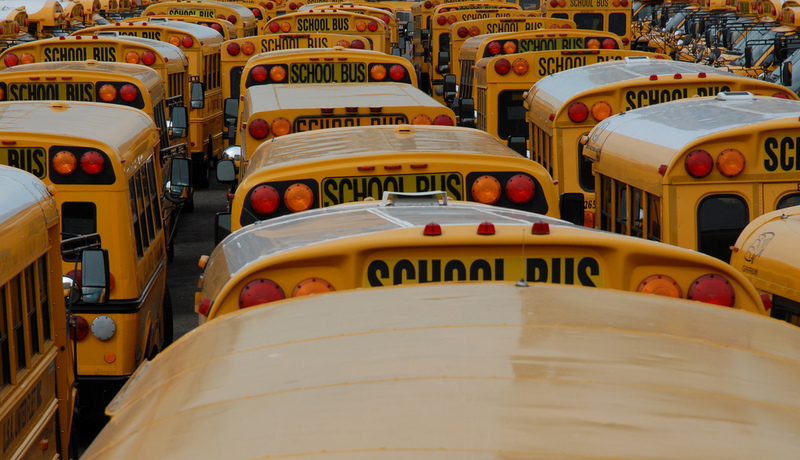 The average school bus carries 72 riders. At 80% capacity, a bus has the same capacity as 58 individual vehicles transporting children to school. Compare the traffic footprint of 58 cars vs. a single 30′ bus, especially considering the added congestion from the “wave effect” of 58 independently accelerating and slowing vehicles. It is easy to see that fewer vehicles in any single location is an effective and practical means of reducing traffic congestion. We should also consider encouraging children to walk or bike to school. In the past, both transportation methods were quite common but, as motor vehicle use has increased in the U.S, active rates of transportation to school have declined steadily since the 1960s. The problem is so pressing that a national partnership of safety organizations – Safe Routes to School – was formed to help address this trend. It would not be a difficult task for many students to walk or bike to school. In fact, active transportation methods can add peace and tranquility to a student’s day, in addition to being associated with numerous health benefits. Granted, not all of our neighborhoods are ideal for walking or biking, and some students do not live close enough to the school to make this kind of change, but it is important that we consider the implications of our transportation choices. The future of traffic congestion depends on encouraging the children of today to consider various methods of transportation. Download one of our walking or bicycling safety flyers, and encourage your students or children to put on their shoes and enjoy the outdoors on their way to school. VIDEO: Focusing on You: Gillian A. Hotz, Ph.D.